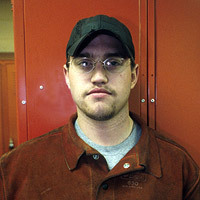 NWC's welding faculty are the contact point for students seeking job placement. In the past six years, the department has achieved 100% placement for those students who want to work. Welding students just entering the field earn wages ranging from $8.50 to $16.00 per hour. Advanced welders who have been in the field for more that one year can earn wages from $16.00 to $27.00 per hour and anywhere from $32.00 to $50.00 per hour if they own their own welding equipment. "I know I'll have a job. Welding is so in demand and always will be."